While I might do unconventional things with batting orders to try to maximize offense, I’m not someone who gets worked up a whole lot about them. With some batting order discussion taking place on the first day of Spring Training for the Dodgers, I’ll offer my two cents, and then probably leave the subject alone. We start off with Tuesday’s news that Dodger manager Don Mattingly said Dee Gordon would be his leadoff hitter and Matt Kemp would bat third, according to Eric Stephen of True Blue L.A.
Gordon is a dubious choice to lead off because of his on-base deficiencies, but I’m going to ignore that for the time being because he’s still too enticing to think about as a sparkplug – cliched or not – and the Dodgers aren’t exactly chock full of OBP-skilled alternatives. More interesting to me is the choice for the No. 2 slot. I can see the arguments for Mark Ellis, Loney or Sands, but I’m not sure they’re any better than the arguments for A.J. Ellis. The Dodger starting catcher’s on-base percentages for his past two seasons in the majors are .363 and .392. Sure, that might not hold up over extended playing time, but I’d at least be interested in testing it out. A No. 2 hitter who walks about as much as he strikes out seems right to me for this team (assuming the Dodgers aren’t willing to recall the age of Paul Lo Duca and bat their catcher leadoff). You’d have to get over A.J.’s lack of speed coming right in front of Kemp, but it’s not as if anyone but Gordon should really be trying to steal with Kemp at the plate anyway. Loney has always seemed made like a good No. 2 hitter to me, but the problem is that using him there would stack two of the Dodgers’ three left-handed regulars together, which is not what I want to see, especially late in a game. I’m gathering that A.J. Ellis won’t see a first-inning at-bat much this year, but certainly, batting him eighth, behind a guy like Juan Uribe, seems like a mistake. But, wherever they’re hitting, these guys are going to have to produce. … Kemp said he actively recruited Prince Fielder over the winter and was convinced he would be in the same lineup as the former home-run champion in the upcoming season. 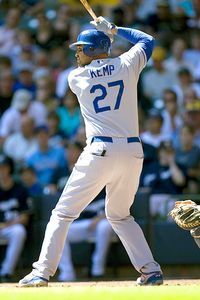 “I was getting real confident in our chances of getting him,” Kemp said. Kemp said he spoke to Fielder several times. Comeback Player of the Year ballot candidate Ronald Belisario reported to Spring Training on time for the first time as a Dodger, notes Ken Gurnick of MLB.com. Zach Lee is the Dodgers’ top-ranked prospect by Baseball America at No. 62, followed by Allen Webster at No. 95 and Nathan Eovaldi at 96. Ted Lilly became a father to his second child, Nora Grace, and was therefore excused from reporting to Camelback Ranch today, according to Hernandez. Congrats to the Lillys. Potential Dodger owner Magic Johnson has another big enterprise on his mind – the founding of a new cable network, Aspire. Details from Jill Goldsmith at Variety. Mike Axisa of Fangraphs made an argument that catching scarcity meant the Yankees should offer Russell Martin a three-year, $30 million contract. Others will disagree. There are some minor rules changes in Major League Baseball this year, including what may become known as the Sam Fuld Rule, reports The Associated Press. (via Baseball Musings). Nationals catcher Wilson Ramos talked to AP today about the aftermath of his kidnapping. “I feel like I’m living again,” Ramos said. If you’re interested, I posted a bunch of TV thoughts today at Variety On the Air. Manny Ramirez is moving forward with plans to get himself back in the majors for 2012, but would probably to need to still serve 50 games as a suspended player, writes Buster Olney of ESPN the Magazine. Ramirez, who turns 40 on May 30, went 1 for 17 with the Rays in 2011 before his season abruptly ended. He could show what shape he’s in with a nonroster invite to some team’s Spring Training. The Dodgers are taking applicants to fill the position of vice president of public relations (link via AZ Snakepit). The Dodgers aren’t holding off until the ownership switch to make the hire: Public relations wait for no one. Clayton Kershaw was interviewed by Molly Knight for ESPN the Magazine. Baseball America’s annual Dodger prospects top 10 has Zach Lee on top, followed by Allen Webster, Nathan Eovaldi and then the first position player, outfielder Alfredo Silverio. Looking at the article, you know what cracks me up? The fifth-highest amateur signing bonus in Dodger history still belongs to 2000 draftee Ben Diggins. I think it’s worth a reminder that Lee could be in the majors before the 2012 season is over, though it probably wouldn’t be until 2013 that he begins making any kind of impact. He’s about a half-season behind the development of Kershaw, whose debut came in May 2008, 23 months after the Dodgers signed him. Lee, who had a 3.47 ERA with 7.5 strikeouts per nine innings and a 1.22 WHIP in 2011 for Single-A Great Lakes, should hit Double-A in 2012 at age 20, the same age Kershaw was (though he’s not at the same performance level as Kershaw, who had 12.4 K/9 with Great Lakes). When the Red Sox hired Bobby Valentine to manage, I joked on Twitter that his ESPN broadcast partners Orel Hershiser and Dan Shulman could join him on the coaching staff. Well, in the case of Hershiser, the Red Sox are in fact interested in him as a pitching coach, writes Sean McAdam of Red Sox Talk – assuming Hershiser’s pursuit of Doger ownership doesn’t get in the way. Some vintage Tommy Lasorda cursing is available in this video passed along by Roberto Baly of Vin Scully Is My Homeboy. Ross Newhan calls the theory a “longshot,” but he explains the substance behind why some think Frank McCourt could renege on his commitment to sell the Dodgers. 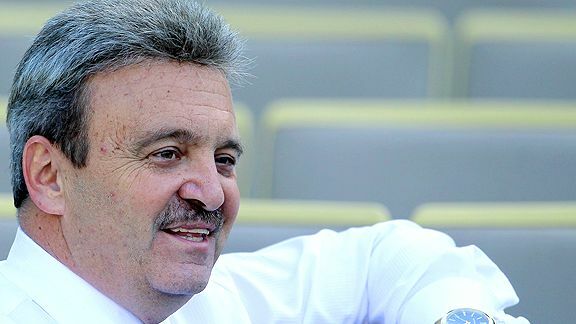 … In announcing his intention to bid for the Dodgers with usual flair and enthusiasm, Johnson said he would try to build the Dodgers in the Showtime mold of his star-driven Laker teams, recruiting prominent players and paying the price for free agents. Two views of the Dodgers’ Chris Capuano signing: Eric Seidman of Fangraphs doesn’t hate it, while Christina Kahrl of ESPN.com thinks it pretty grim. 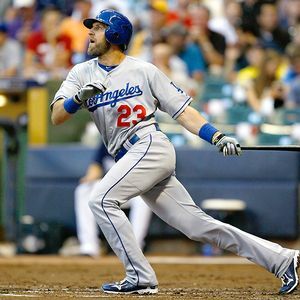 DodgerTalk alum Ken Levine said he will do more Seattle Mariners radio broadcasts next year. 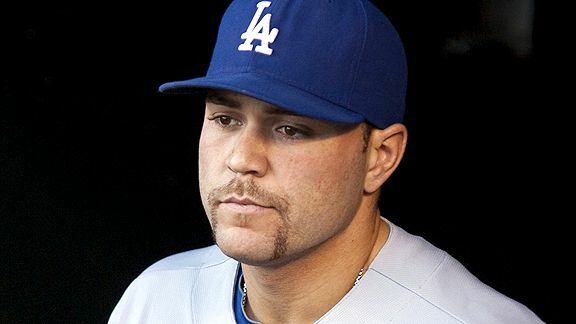 Russell Martin is expected to return to the Yankees in 2012, writes Andrew Marchand of ESPNNewYork.com. Ken Arneson has an interesting piece on why the opening of a Giants Dugout Store in Walnut Creek is meaningful to the rest of the baseball world. Jeff Lewis/AP There’s home, Nomar. There’s home. For the five years since it took place, I’ve had this vision of the 4+1 game. September 18, 2006. I replay the game in my head, a game that, unfathomably, stood toe-to-toe with the R.J. Reynolds game in 1983 as the greatest game in Dodger Stadium history, and I hear The Who’s “Had Enough” as the soundtrack. 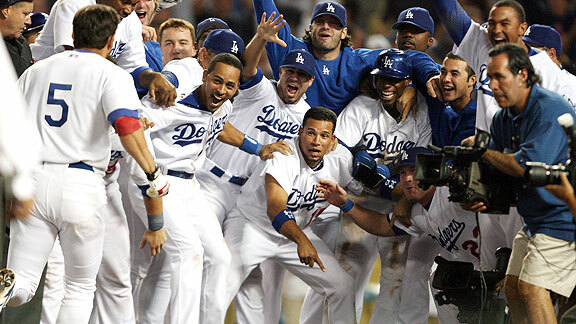 As the 2006 baseball season bore down on its finish, the Dodgers were in a vexing battle with the San Diego Padres for first place in the National League West. An 11-5 pasting by the Padres knocked Los Angeles into last place on May 5. The Dodgers staggered back and reached first barely a month later, but in a tight division, San Diego drove them back to last with a 7-6, 11-inning victory July 24. It was that kind of year. When the first day of August dawned, the Dodgers were still on the bottom looking up. Just 10 days later, Kenny Lofton’s walkoff RBI single beat Colorado, and the Dodgers were atop the NL West looking down. And there in first place they stayed, until September 17, when Padres pinch-hitter Termel Sledge’s RBI single in the ninth inning broke a 1-1 tie, leading to Jonathan Broxton’s first career loss in the majors. The Dodgers had handed first place back to San Diego again. Three players who had begun Sunday’s game on the bench were in the Monday starting lineups. The fellow batting cleanup for San Diego was familiar – his name was Mike Piazza, slugging .500 in his first season in San Diego after 7 1/2 in New York and in his final season in the National League. 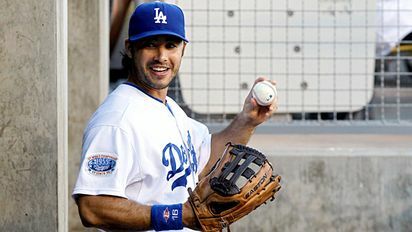 For the Dodgers, the two big changes were these: Rookie outfielder Andre Ethier was rested in favor of new acquisition Marlon Anderson, and returning to play after missing two games with a strained quad was Nomar Garciaparra, who had talked manager Grady Little into starting him. At the time, you had to know their numbers or their looks to know who these guys were – this was part of the brief era in which the Dodgers wore no names on the back of their jerseys. On the mound, who knew what to expect? Brad Penny had earned a start in that summer’s All-Star game, striking out Ichiro Suzuki, Derek Jeter and David Ortiz in the first inning, but had been inconsistent ever since, posting a 5.81 ERA. In his past two starts, he had lost 7-0 to the Mets and won 6-0 against the Cubs. On the other side, Jake Peavy had been dominating the Dodgers as usual (two runs allowed in 14 previous innings that year), but his overall season ERA was a modest 4.17. 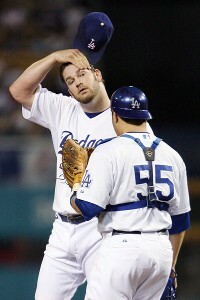 Jeff Lewis/AP Russell Martin tries to settle down Brad Penny in the midst of San Diego’s four-run first inning. With fans still pouring in to the ballpark, Penny retired the first two hitters, Dave Roberts and Brian Giles, before Adrian Gonzalez lined a 3-1 pitch into center field, bringing Piazza to bat. “In recent games against the Dodgers, Mike looked like he was pressing,” Scully said as Piazza worked the count full. “He was trying to pull pitches that were down and away.” Almost on cue, we saw vintage Piazza, hammering the 3-2 pitch, driving it five feet below the top of the center-field wall on the fly, for an RBI double. The game was on: 1-0 Padres. Penny walked Russell Branyan, bringing a visit to the mound from Rick Honeycutt and a visit to the plate from Mike Cameron, whom Scully pointed out had hit five home runs against the Dodgers so far in 2006. On the first pitch after Honeycutt returned to the dugout, Cameron shot the ball off the short wall in right field for a standup triple, driving in two runs (Nos. 14 and 15 vs. Los Angeles that year) to make the score 3-0. “The Dodgers in a huge hole,” Scully said. Down in the Dodger bullpen, Aaron Sele began to warm up – not for the first time this night. Not by a longshot. Nor was the hole finished being dug. Geoff Blum hit an 0-2 pitch to right field to drive in Cameron for a 4-0 lead, before Josh Barfield flied out to finally end the inning. But the Dodgers wasted no time trying to rally. Rafael Furcal bunted for a single, and Lofton’s hit sent him to second. Garciaparra hit into a 6-4-3 double play, but ever-irascible Jeff Kent doubled to deep center field, driving home Furcal to get Los Angeles on the scoreboard. Peavy limited the damage to one run, but as he walked off the mound, he and Dodger first-base coach Mariano Duncan began shouting at each other. The Dodgers pulled closer. After Penny struck out three in the second inning, Anderson – the August 31 discard from the Washington Nationals who had made surprising contributions in Los Angeles – hit a one-out solo home run. And after Russell Martin threw out Cameron trying to steal to end a two-out Padre threat in the top of the third, Furcal hit a solo homer of his own to dead center field. 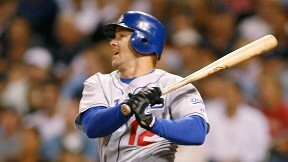 Jed Jacobsohn/Getty Images Jeff Kent, shown here against the Padres in August, went 4 for 5 with three extra-base hits. Before the inning was over, Kent hit his second double in as many at-bats, once more to center field, a ball at the wall that Cameron leaped for but came up empty. “Standing hands on hips, trying to figure out how he missed it,” Scully observed. J.D. Drew entered the box next, and he sliced a breaking ball left up in the zone by Peavy for a ground-rule double to left field to tie the game, bringing the crowd to its feet. In fact, Martin then almost put the Dodgers ahead right there, but Peavy speared the first-pitch line drive off his bat. The score was 4-4 after three innings. Not once over the next four innings was a team retired in order, but not once did a team score. Each missed a tremendous opportunity. In the top of the fifth, after another Gonzalez single, Penny walked Piazza and Branyan to load the bases with two out, but Cameron flied to right. In the bottom of the sixth, Anderson singled, Wilson Betemit walked and pinch-hitter Oscar Robles loaded the sacks with none out when he sacrificed and reached first on a fielder’s choice. 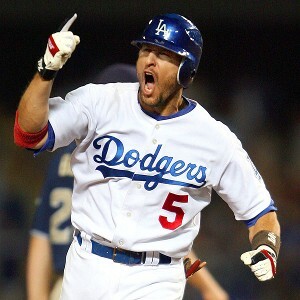 But Furcal hit into a forceout at home, and then Lofton grounded into a 1-2-3 double play. By the eighth inning, the starting pitchers were long gone. And so was any remnant of sanity in this game. The attendance was announced. Five years ago tonight, the Dodgers drew a legitimate 55,831 fans. Five years ago tonight, the Dodgers registered their highest ticket sales for a Monday game ever, capping a record for a four-game series: 219,124. Broxton entered the game in the eighth inning. Scully commented that after Sunday’s loss, Broxton had said wasn’t nervous, but he was worried he had been tipping his pitches. “Jon was just 22 in the middle of June when he made the jump from Jacksonville, and now he has the key role as the set-up man.” It was his fifth game in seven days; he had thrown 88 pitches since the previous Tuesday, and was about to throw 22 more. Things soon turned grim. With one out, Blum walked, and Barfield drove one to right-center field that Drew couldn’t get. 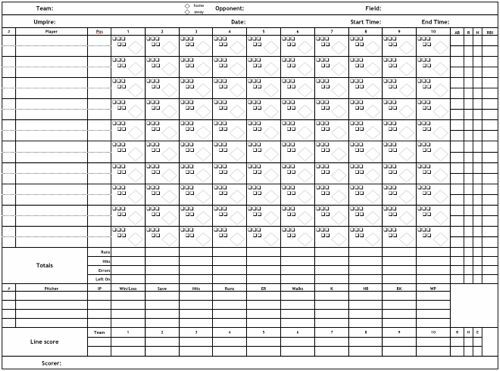 Lofton overran the carom, Martin dropped the throw home, the go-ahead run scored and Barfield ended up on third base. Pinch-hitter Todd Walker then hit a flare over the drawn-in infield to give San Diego a two-run lead. Roberts struck out (a career-high fourth for the former Dodger outfielder), but Walker went to second on a steal and third on a wild pitch. Giles then sent Drew to the right-field wall, which he banged into while making the inning-ending catch. Not once had the Dodgers led, but not once had they failed to score in an inning in which they trailed. Sure enough, off reliever Scott Linebrink, Anderson drove one down the right-field line, running through a stop sign to reach third base with a triple, and Betemit lined an 0-2 pitch up the middle. Just like that, the lead had been reduced to one. “Boy is this a game, huh?” Scully marveled. “Wow. And this crowd loving every moment of it. It’s been a roller-coaster ride from depression to euphoria and all the stops in between. With two out, Lofton doubled with two out to send pinch-runner Julio Lugo to third base. Tying run was 90 feet away, go-ahead run one base behind him. But Garciaparra struck out. You could practically fit the goat’s horns for him. Takashi Saito, the 36-year-old first-year major-leaguer from Japan, was asked by the Dodgers to protect the one-run deficit. There was little reason to expect he wouldn’t: In 70 innings, emerging in the spring in the wake of Eric Gagne’s last gasp as a Dodger, Saito had a 1.93 ERA and 93 strikeouts against 63 baserunners in 70 innings. But Gonzalez led off the ninth with his third single of the game, and Manny Alexander (Piazza had exited the game for a pinch-runner in the seventh) bunted him to scoring position. Up came Josh Bard, the Padres’ lesser-known catcher but one who had an .869 OPS, even better than Piazza at that moment. On a night filled with long fly balls, Bard drove what appeared to be the capper of the night, to deep center. Lofton went back. He leaped. His glove went over the fence; the ball banged off his wrist and back onto the field, while an uncertain Gonzalez advanced only to third. “Goaltending,” remarked Scully as he watched the replay. Saito walked Cameron intentionally in the hopes of forcing an inning-ending double play, but his next pitch to Blum went to the backstop, and the Padres doubled their lead. Then Blum hit a sacrifice fly, and San Diego led by three in the ninth. Scully practically threw the white flag. It’s not as if the Padres got greedy after that, but you could argue they suffered from an embarrassment of riches. After Barfield singled to drive in Cameron and give San Diego a 9-5 lead, Scully glanced back at the Padres bullpen, looking to see if Trevor Hoffman was still getting loose. Jack Cust made the third out of the top of the ninth. The Dodgers trailed by four runs in the bottom of the ninth. Up to that point, Adkins had allowed one home run in 51 1/3 innings in 2006. “The Dodgers are asked to do what they did (before), but they’ve run out of innings,” waxed Scully. Francis Specker/AP J.D. Drew follows through, bringing the Dodgers within two. Kent conducts a 1-0 pitch to center field, over Cameron, and out of the park. “And another drive to deep right center, and that is gone! Whoa, was that hit!” exults Scully. Hoffman is quickly rushed into the game. “He has been absolutely magnificent against everybody, but especially against the Dodgers,” Scully says, adding that Hoffman’s last blown save against the Dodgers was in April 2001. Francis Specker/AP Martin hits it a ton, bringing the Dodgers within one. Hofman throws his first pitch. Francis Specker/AP Marlon Anderson lets it fly, and the Dodgers are tied. Anderson is the next batter. He has four hits and needs a double to hit for the cycle. As Martin practically had to be restrained in the dugout from running onto the field, Anderson raced around the bases, leaping into his high five at home plate before sprinting to the dugout, where he disappeared under a white and blue volcano. Before the cheering had even begun to subside, Lugo swung at his first pitch – still only the third pitch Hoffman had thrown in the game – and hit it on a trajectory to right-center that, for an instant, made the fans double-take. But it landed in Cameron’s glove. Ethier, batting for Saito, blooped out. In the Dodgers’ last chance to win in nine innings, Furcal, 2 for 5 with a home run already, tattooed one himself, taking Giles to the warning track to right field before it was caught. “Well, wouldn’t you know this was gonna go extra innings?” Scully said. “No, I don’t think you did when it was 9-5 in the ninth. 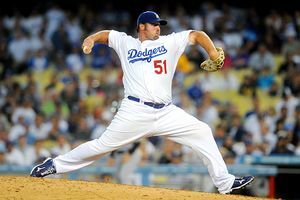 With their top relievers already used, the Dodgers turned the guy that had warmed up for the first time back in the first inning, Aaron Sele. 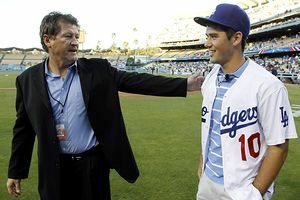 One of general manager Ned Colletti’s ongoing reclamation projects on the mound, Sele had joined the Dodger starting rotation in May and had a 2.91 ERA in 65 innings before the All-Star break. After a couple of poor July starts, soon followed by the acquisition of Greg Maddux, Sele ended up spending most of his second half in the bullpen (the Dodgers’ No. 5 starter that September, you might be surprised to remember, was Hong-Chih Kuo). Sele’s ERA had risen to 4.35, and he had pitched three total innings in the past two weeks. But with the score 9-9, the Dodgers went to Sele over the other available options in the September Dodger bullpen: Giovanni Carrara, Elmer Dessens, Tim Hamulack and Eric Stults. Sele retired Roberts (0 for 6) on a fly to center, but Giles doubled on a sharp hit down the left-field line past Lugo. Gonzalez, who had been tormenting the Dodgers all night – then again, who hadn’t – was walked intentionally. Sele dodged that bullet, but couldn’t avoid the next. Bard singled to right field, and Giles came home from second to score and once again give the Padres the lead. Threatening to once again put the Dodgers down by four, Sele walked Cameron, who became the 23rd Padre to reach base. 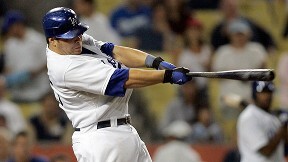 With no room to put anyone else, Sele, on the Dodgers’ 200th pitch of the game, induced an inning-ending fly to right. Padres 10, Dodgers 9, heading into the bottom of the 10th. Rudy Seanez, who had pitched for the Dodgers in 1994 and 1995 (and would do so again in 2007), was the Padres’ 23rd player of the game and seventh pitcher, chosen ahead of relievers Scott Cassidy, Brian Sweeney and Mike Thompson. Nearing his 38th birthday. Seanez had struck out 52 in 51 innings combined with Boston and San Diego, but he had walked 29 and allowed seven home runs. His first pitch to Lofton was a called strike, but his next two missed the zone. Strike two came on a check swing, but the next pitch was high and the one after that was inside, “and the Dodgers have a rabbit as the tying run,” Scully said as Lofton dropped his bat and headed to first base. 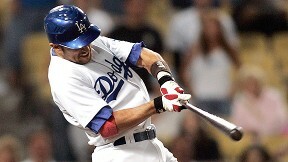 To the plate came Garciaparra. Low and outside for ball one. Fastball for a strike. Low and outside for ball two. Inside for ball three. Jeff Lewis/AP Garciaparra celebrates on behalf of Dodger fans around the ballpark – and televisions and computers. To this point, I haven’t quoted from the Dodger Thoughts game thread from the night of September 18, 2006. But while any one of us would rather have been in the ballpark, the online experience is not one I’ll forget. Gameday seems to be broke. It keeps on saying every Dodger hitter is hitting a home run. Major software bug or something. Dodgers at Nationals, 10:05 a.m.
A.J. Ellis has a .405 on-base percentage this season and, in 216 plate appearances, a .360 OBP in his career. On a ballclub that has struggled with on-base skills (even considering the recent offensive surge), we’re past the point of considering whether Ellis belongs. He deserves a spot on the team until he proves otherwise, not the other way around. Ellis has thrown out 27 percent of opposing basestealers in his career (13 of 48) with one career error and two career passed balls in 511 1/3 innings behind the plate. Martin has played more and been more effective defensively, but offensively, Barajas’ power has been an asset this year. 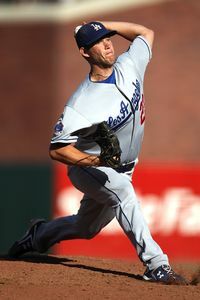 Barajas would have to be willing to take a paycut to return to the Dodgers in 2012 – perhaps he will. Tim Federowicz has a .431 on-base percentage and .627 slugging percentage with six homers in 83 at-bats since coming to Albuquerque in the Trayvon Robinson trade. Expect the Dodgers to call up the 24-year-old in the next couple of days. On April 23, Russell Martin homered twice and walked, raising his 2011 on-base percentage to .410 and his slugging to .723. Since then, Martin has gone 8 for 52 with nine walks, a .279 OBP and a .250 slugging. Martin is still having a better season than the man who replaced him on the Dodgers, Rod Barajas, but the difference between the two is shrinking. The power is there with Barajas, whose main problem continues to be his walks – only five (against 33 strikeouts) in 126 plate appearances. I couldn’t resist finding the irony in the fact that amid the maelstrom of poor-performing, massively paid Jorge Posada being dropped last in the Yankees’ lineup and then pulling himself out of the game entirely, the player selected to replace him Saturday was Andruw Jones, who knows a thing about maelstroms of poor-performing, massively paid players. The other thing I noticed is that Posada’s adjusted OPS of 71 is still considerably higher than James Loney’s 50, even though Loney is on his hottest streak of the season. Scott Podsednik’s spring is not off to an ideal start, far from it, but at least he can take some solace in knowing that other years have also started poorly and turned out fine. “It’s a crazy game,” he said Wednesday after checking into camp with the Toronto Blue Jays. “A couple of years ago I was sitting on my couch at the start of the ’09 season, so anything can happen. A sound approach and, given the circumstances, a wise one for the speed demon and former all-star. Podsednik arrived in camp on a minor-league contract signed last week, the best deal for him after an off-season that didn’t play out anything like what he expected. The 28-year-old Martin passed a physical before signing a one-year, $4 million contract in December to replace Jorge Posada behind the plate. But within a matter of days, it was announced he would undergo surgery to repair “a small meniscus tear” in his right knee, the same surgery both Posada and CC Sabathia underwent in the offseason. At the time, general manager Brian Cashman said, “It’s not a serious surgery at all,” that Martin’s recovery would take two to three weeks and that the catcher would be “back to normal within a month.”But now, nine weeks after the surgery, Martin is still feeling discomfort. Worse, on Wednesday, he added three ominous letters to the mix: MCL, as in medial collateral ligament. Baby, why you gotta treat me this way? Very quietly but very honestly, Hall of Fame sportswriter Ross Newhan segued into a reflection about drinking too much on the job. Aaron Miles is a candidate to be this year’s Nick Green. 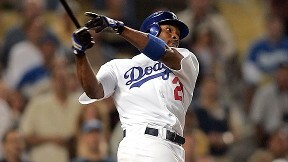 The Dodgers signed him to a minor-league deal, and Tony Jackson of ESPNLosAngeles.com has details. 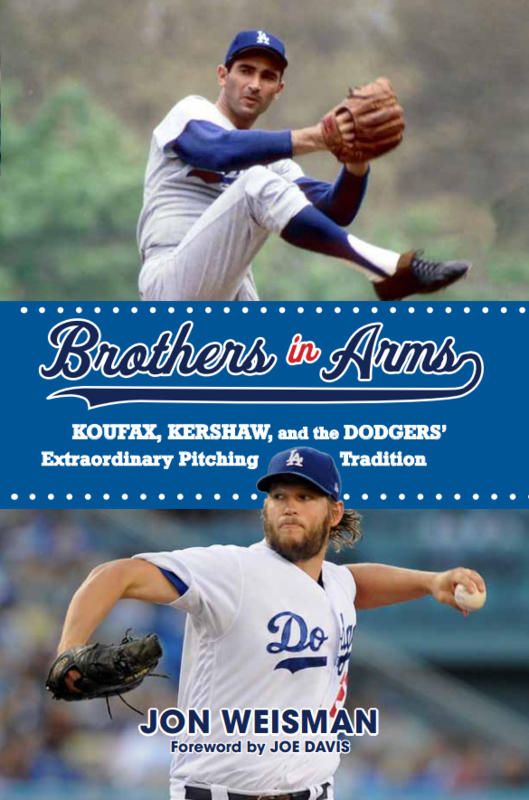 If you want a real treat, hie thee to the South Pasadena Library on Oxley Street Feb. 17 to hear Dodger team historian Mark “Scoop” Langill speak. Mike Petriello of Mike Scioscia’s Tragic Illness concludes that Michael Young is a dubious trade target. Carlos Santana has recovered from knee surgery and is cleared for all on-field activities, reports The Associated Press. It’s a different set of questions than those concerning the Dodgers’ third outfielder, but questions nonetheless surround the Phillies’ final outfield spot, notes Rob Neyer of SB Nation. The state of Don Mattingly is profiled by Ramona Shelburne of ESPNLosAngeles.com. Evan Bladh Sr. of Opinion of Kingman’s Performance continues to knock ’em out of the park – here’s a great story about the Dodgers and Mister Marty. The frustrating thing with Russell Martin is that he keeps telling us in April that he’s training like he’s never trained before, and then the following winter he inevitably tells us, “No, not really.” Anyway, Martin tells the Canadian Press that he had some personal “distractions” and “frustrations” during his last two years with the Dodgers, but this year, he’ll be back. Dodger pitching prospects Javy Guerra and Chris Withrow were continuing their rehab from injuries at the team’s recent minicamp in Los Angeles, writes Ken Gurnick of MLB.com. Delino DeShields Jr., the 18-year-old reigning first-round draft pick of the Houston Astros, was charged with a DUI, according to Zachary Levine of the Houston Chronicle. Danny’s Farm, the Altadena animal farm tailored for special-needs children that was founded by former Dodger pitcher Jim Gott and his wife Cathy, has been closed because of zoning restrictions, reports Corina Knoll of the Times. Satchel: The Life and Times of an American Legend by Larry Tye gets praise from Rob McMillin at 6-4-2. Steve Dilbeck of the Times has a praiseworthy recap of Dennis Gilbert’s annual Professional Baseball Scouts Foundation dinner Saturday. Crzblue’s Dodger Blue World has a post with information on what is believed to be the 53 living former Brooklyn Dodgers, led by 101-year-old Tony Malinosky. (link via Dodger Thoughts commenter Mike Tink). Here’s a link to a 2009 KCLU interview with Malinosky. 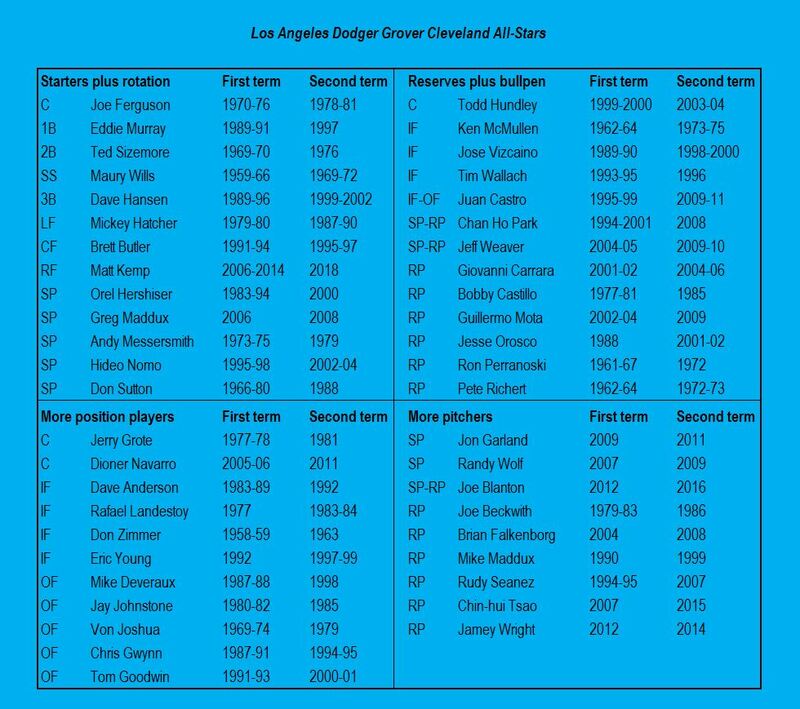 Roger Schlueter of MLB.com looks at Clayton Kershaw’s accomplishments to date in a historical context. It’s really a complicated dance between struggling player and dubious team. As we now know, Russell Martin did not score any financial windfall by signing with the New York Yankees after parting ways with the Dodgers. So from a money standpoint, there’s no indication whatsoever that the Yankees wanted Martin more than the Dodgers did. Further, we know the Dodgers had a handicap. They were bound to the possibility that Martin might earn a substantial raise through salary arbitration, had they guaranteed him a 2011 contract at the December 2 deadline for eligible players. Martin himself understands why the Dodgers might not have wanted to take that risk. Despite all that, it’s pretty clear from his introductory press conference with the New York Yankees — who have named him their starting catcher — that Martin’s ego was bruised by the whole experience. On an emotional level, you can understand it, even if it isn’t quite logical. Martin himself seemed to be struggling with the contradiction. 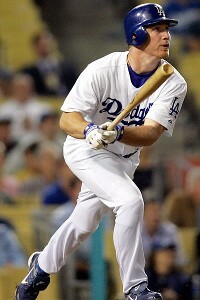 “Not necessarily surprised,” Martin said of his reaction to being non-tendered by the Dodgers. “I always knew that there was a possibility, and it was probably a tough call for them. You have a guy who wasn’t doing that good past couple of years, and probably getting a raise again (if arbitration was involved. The Yankees, essentially, never had the same opportunity to hurt Martin’s feelings (justifiably or not) the way the Dodgers did. And so, once that December 2 deadline had passed, a fresh start was inevitable. Martin said he doesn’t regret the money he possibly might have lost in the transition. “I just really wanted to find out, and the only way to find out how much a team wants you is you take a risk,” he said. Of course, Martin represents a risk for the Yankees as well. Not only has he been recovering from his season-ending hip injury, but his physical revealed a small meniscus tear in his right knee that will require surgery. The recovery time is expected to be three weeks. Not surprisingly, Martin said he isn’t concerned. Martin added that his hip has felt fine for about a month. He said that he can’t say for sure how it would feel after catching 10-12 games in a row, but then conceded that people don’t necessarily want him to do that anymore, as much as he might resist rest. Martin also talked about his offensive struggles of the past two years. In recent winters, stories of Martin’s offseason training have often come across like warning signs, each year seemingly bringing a different approach. Mostly, he feels he lost strength, then tried to compensate with his swing and ended up fouling that up. This winter, he suggests, brings the back-to-basics edition. He noted that while his offense has regressed, he feels his defense and handling of pitchers has only improved. In the end, Martin seems genuinely pleased with where he has ended up: closer to his family home, in an everyday role (health permitting) and with another (and of course potentially better) contender. “My main goal is to have a chance to win,” Martin said, “and if you want to pick a place to win, I don’t think there’s any better place to pick than New York with the Yankees. Martin doesn’t leave Los Angeles without some regret. “We got a taste of what we wanted to accomplish,” he said, “but there’s only one winner, and the goal is to win the World Series. We got to the playoffs — we had some good seasons, (but) we fell short a couple of years. It was a great experience, a good learning process. According to Buster Olney of ESPN.com, Russell Martin’s base salary with the Yankees will be $4 million – lower than the Dodgers’ final offer to him two weeks ago. Not sure what the incentives were in the case of the Yankees’ deal – with the Dodgers, it’s been reported that he could have earned $1.5 million in incentives. Martin has passed his physical, Olney reported.